This week we're going to introduce a feature available to your company YouTube Channel called InVideo Programming, teach you how to set it up and show you some strategic ways you can use this feature to promote your business. To get started, you need to be in the Channel Settings, which you can get to by clicking on Video Manager and finding Channel Settings in the left sidebar. From there you will see the InVideo Programming option in the left sidebar. Once you click in to InVideo Programming you will see two main sections, Branding Watermark and Feature Video. The Branding Watermark feature lets you display your company logo or other brand image overtop all of the videos that are uploaded to your company YouTube channel. If you are going to use watermarks for your videos, it's best to have your video production company add it in while they are editing in post production. That way it won't interfere with your content by coming in at the default time instead of right at the perfect moment. However, if it's a homemade video or the video was already finished without a watermark, you can still have YouTube add it to your video. The benefit of using the Branding Watermark is that when a viewer rolls their mouse over the watermark, they have the option of clicking it to visit your channel. This is great for when your video shows up in search but the viewer hasn't heard of your company or hasn't yet visited your channel. It captures them and prompts them to connect further with your company channel by visiting it and subscribing. If your video production company adds a watermark during post production, you can still make it a link clickable to your channel, you will just have to do it in the annotations section for each individual video. To add a Branding Watermark you will first need to upload the image you plan on using. Keep in mind this image will be going on all videos, so make sure it is universal to your channel and that it will be easy to see on all videos, no matter their coloring. The image is displayed as an opaque overlay, so YouTube recommends a transparent, monochrome image in a png file. Once you have uploaded your image you can choose when to display the watermark and for how long. We recommend displaying it at the end of the video and here's why: YouTube keeps track of how long people are watching your videos. They track if people are watching the whole thing or if they are watching the first few seconds and then clicking away to something else (this information is available to you, too, in YouTube Analytics). Every time someone watches your video until the end or for the majority of the length of the video, YouTube considers that a vote that the content is valuable and met that viewer's expectations for search. You want people watching to the end of your videos and not clicking away early so that YouTube knows your videos are popular and knows to move them up in search results. Placing the watermark at the end of the video instead of the beginning makes sure that the viewer won't click away to your channel before the video ends. As for how long to display it, a good standard amount of time would be 30 seconds. If your videos tend to be short 60-90 second clips, 15 seconds would work. If they tend to be 15-30 minutes long, a one minute watermark would be appropriate. Once you have determined the display time and duration, click update and your watermark will display on all of your company channel videos, even videos that have been previously uploaded. The InVideo Programming feature also allows you to overlay another video in the corner, so that when people are finished with the video they are watching, they have a suggestion of what to go on to next. As with the Branding Watermark, you also have the choice of when you want to display the feature video and for how long. Like we mentioned above, it's best to display it at the end of the video so that you get the maximum amount of watch time for that video. Featured Video also allows you to add a custom message above the title of the video to further entice the viewer to watch the video you suggest. Keep in mind that this feature video will be the same over all your videos. Your goal with the featured video is to capture your audience so that they watch more of your content, and begin to get to know your company and develop a bond with it. If you choose one of your uploaded videos to feature, choose a video that has been professionally produced and that adds value for the viewer. To remove either a Branding Watermark or Feature Video from your channel, just click the remove button. Watch until the end of the short video below to see how InVideo Programming is displayed. Next week we come to the end of our YouTube Channel series. You won't want to miss learning about a very important hidden feature available to your company YouTube channel to drive traffic straight to your website. See you next week! About Talking Head Studio Talking Head Studio is an Orlando video production company offering full-scale video production services to local businesses and national clients alike. Looking for Part One? Click here. 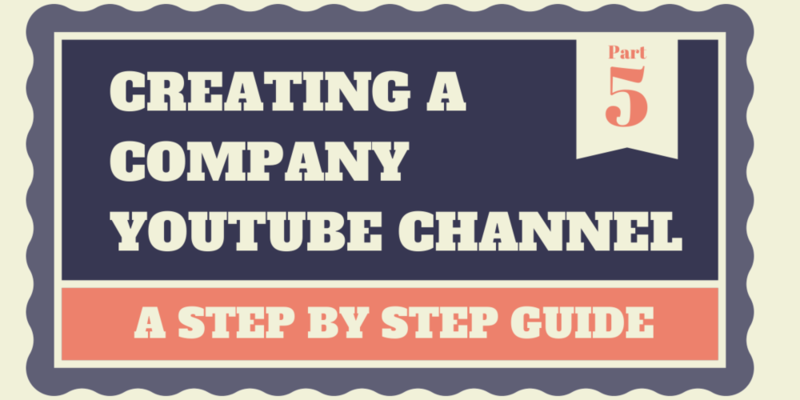 In Part Two of our step by step guide to setting up a company YouTube channel, you are going to focus on the components that are seen by users: the description, images, and links to your other online properties. All of these edits can be done from the main page of your channel by clicking on the "My Channel" link. Who is our target audience. Who do we want to watch our company videos? Why should our target audience watch our videos? What's in it for them? What's our conversion goal for people who watch our videos? Do we want them to subscribe to our YouTube Channel, watch another one of our videos, visit our website, follow us on Twitter, etc. This is the call to action you will use throughout the channel. What keywords do we want to show up for in Google and YouTube search? Knowing these four things will help you easily make consistent decisions when going through the YouTube Channel setup process. Who your company is and what they do. What kinds of videos and playlists viewers can expect to see on your company YouTube channel and why they should watch them (what's in it for them?). Use the keywords you came up with in step one in your channel description. If you're a local business, include the name of the city you're located in and/or the communities your company serves. Once you've written your description, click on the "About" link when you're on your Channel page, and edit from there. Step Three: Add Links It's great that YouTube gives you ample space to share and promote your website links as well as links to your other social media accounts. Take advantage of this area as best you can. In the lower half of the About section when you are on your Channel is where you will add all of your links. In the first area, you can add custom links to your website, and certain pages within your website. The first link should be your main website, since it is the only link that will be displayed over your YouTube Channel Banner. The rest of the custom links can be whatever you would like them to be. They can be links to the contact page on your website, or to a specific product you would like to promote. They can even mimic the navigation on your website. In the Social Links area below, you will enter all of the links to your social media accounts. Make sure all of your social media accounts are represented here, so people can choose the platform on which they feel comfortable connecting with you. If a social media platform you use is not on this list, add it in the custom links section instead. We do this with LinkedIn, since it is not an option in the social links section. Step Four: Add A Channel Icon If you added an avatar photo to your company Google+ page when you set it up last week, you can skip this step. But if you didn't, or for some reason you want your Google+ photo and YouTube photo to be different, just click on the current Channel Icon to upload your new image. Channel icons are 800 x 800, and displays very small on the site so you'll want to make sure it is a simple, close up image. Your logo often works the best. Step Five: Add Channel Art This is the trickiest part about the YouTube setup because the size of the Channel Art depends on what screen the viewer is currently using: mobile, desktop, tablet, or television. The best channel art is visually appealing that captures the attention of visitors and has minimal text. Next week we will continue with the YouTube Channel setup, and talk about the Channel Trailer feature, as well as how to beef up your YouTube Channel with content even if you only have a couple of videos.